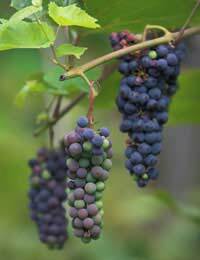 Growing grapes in your garden is as easy as growing any other type of soft fruit. As long as you have a south-facing garden in a relatively warm spot you should have no problems growing grapes outside. Alternatively, you can grow them inside a greenhouse if you live in the north of the UK. The best time to plant a grapevine is from October until March. Choose a south-facing position and grow the vine up a wall or sturdy structure, such as a pillar. Dig a hole 15cm deep and 15cm away from the support (wall, pillar, etc). Place the rootball in the hole, refill the space with soil and gently tread the soil around the stem to firm it into place. Cover the soil surface around the vine with a thick mulch of well-rotted manure or compost to help protect the roots from frost. Indoor grapevines can be planted in the soil on the outside of a greenhouse and the trunk trained to grow inside, via a hole in the wall. This method of cultivation is often applied to vines that are grown in greenhouses with concrete floors. However, it is important to provide ventilation (usually via an open window) for grapes grown under glass. This ensures that humidity levels are reduced as the fruits ripen. A common pest of grapes grown in greenhouses is red spider mite. The mites thrive in hot, dry conditions and can devastate a plant if allowed to spread. Maintaining good hygiene will reduce the problem. Misting the plant will increase humidity (creating adverse conditions for the pest), however humidity can also hamper the quality of the berries. A grapevine will grow happily in a pot and produce grapes every year if well cared for. Grapevines can be kept in large pots for several years. To maintain a healthy grapevine in a pot, top-dress every spring. Simply remove 15cm of compost from the top of the pot and replace with a fresh layer of well-rotted manure or compost. Regular watering and feeding during the growing season will be required to maintain nutrient levels to ensure the plant grows properly. Grapes are a fantastic fruit to grow in your garden. They can be grown indoors in a greenhouse or conservatory, or grown outdoors along a wall or in a container. You can eat the grapes fresh on their own or in salads, or even try your hand at making your own wine. Please I would like to know if there are Nigerian grape farmers here and I'll like to meet you. Thanks. What product can I buy to get rid of Black Rot? Our vine was decimated this year - but I can't find what product to use or where to buy it! I should point out that I am in the UK unlike many of your readers. Thanks, Dawn. What product can I buy to get rid of Black Rot? Our vine was decimated this year - but I can't find what product to use or where to buy it! I want to know if we have any grapes producing farmers here in Nigeria, if yes please i will like to know where they are on have information about them. Thanks. @Tora - You should wait until they are ripened which is autumn in the UK. Your vine will also need something to climb up - but it's fine to grow a vine indoors as long as it gets plenty of sunlight. My mum brought me a vitis grape vine. I have no graden and I'm growing it in my bay window. I'm completely new to growing grapes, any advice would be great. There were grapes on it when it was brought but in each bunch there is still a few green grapes in each bunch, do I pick them or wait till there all rippend,? Please is it advisable to use butterfly as a pollinator in a green house grape farm? Where can I get/buy a vine shoot in Nigeria, to plant in Lagos? I'm afraid we do not have this information where you can buy locally as we are a UK-based site. You may be able to buy one online and have the plant shipped to you direct, if you can't find one to buy locally. You don't say how many vines you are growing i.e whether you are growing to farm, or whether you just have one of two vines. If you can construct some form of removable shelter, then this would help both protect the grapes from water damage and subsequently grape rot and the likes of downy mildew or brown spot. After reading your response to the Maiduguri grape farmer, Central Kaduna, will partial shade suit the newly planted grapes? It depends on the climate you are growing your grapes in. Obviously, if you are growing grapes in searing heat, then your grapes will experience sun damage, so in this case partial shade is best. However, grapes do need sun and if you grow them in a shady area then the fruit will be considerably smaller. A warm sheltered area is good where the sun is not too hot, but there is plenty of warm sun throughout the growing day. Cool evenings are also beneficial. If you feel you have too much sun, you can manage the canopy of the leaves to protect the grapes. Do as much research as you can into the best place in your garden and the surrounding macro and micro-climates and you will be fine. Maiduguri, Borno State, Nigeria is a relatively a hot climate region. I planted my grapevine more than five years ago. It has grow well into a tree; but produced not a single fruit. I need an advice on how to make my grapevine a productive one. How frustrating for you! There could be many reasons. You speak as though it is a lone grapevine and while there are a few male plants that never develop grapes, namely (Vitis riparia or vitis rotundifolia Michx), most do. However, your vine will need nearby female or male plants in order to cross pollinate which will help produce your fruit. This is usually helped by the wind or insects, but there does need to be other plants in the region in order to allow this to happen. Another reason may be lack of pruning. You don't say what your plant is grown in. Vines love well-drained, soil. If the soil contains too much nitrogen, or if you've over-fertilized then your plant may produce beautiful flowers and leaves, but no fruit. Many professional vine growers also prune their vines radically in the cooler months, this helps to produce a new abundance of fruit. There are also certain diseases that can damage leaf and flower buds that will prevent growth. You don't say how your vine is positioned, whether in full sun or partial shade, this may also have an impact. You can do a bit of online research when you have weighed up these facts and I'm sure you will come up with some answers, or you can find out more information via the link here.Good luck. What is variety of grape pictured at the top, please? I have been given a bagfull of them and wanted to know what are they best to make? Ta, G.
@Kaka - grapes can be grown in areas of Nigeria where it is more temperate. They would need to specific care and an adequate amount of water. Places such as Jos may be more agreeable because of its cooler climate (18 °C - to 25 °), plus its higher elevation above sea level which makes for cooler breezes which can help aid growth. Thank you Marches for elaborating and balancing out type of grapes that can be grown in UK.I find advice on grapes has been quite notorious, despite up to date information, same is quoted with small modifications. It has taken me several hoursto get to your post. The thing is we're always getting sold the same old varieties. None of them are particularly disease resistant except Seyval and most of the outdoor types give small seedy grapes not so good for eating and often too acidic for that in our climate. But so many table grapes (eating grapes) have been developed which do perfectly well here, are disease resistant, ripen early, produce better yields, have fine flavours and some are seedless too. For eating I'd recommend Muscat bleu and Esther (both blue seeded grapes). Jupiter, Canadice, Himrod, Swenson red, Somerset seedless are also very good and seedless. Some good, easy and disease resistant wine grapes are Phoenix, Solaris (both white) and Regent and Rondo (both red) Varieties for cooler northern areas and Scotland are Solaris and Rondo for wine and Somerset is good for eating. Somerset seedless is even successfully grown in Norway, Finland and Northern Russia. Many more are also suitable but are not widely available yet. The best place to get these from is Sunnybank vines and they'll also give you advice if you need on what the flavours are like, what is suitable for your area, etc. @PJ4 The Black Hamburg is a vigorous grape vine that grows well in a ventilated greenhouse, as well as outside against a south or south-west facing wall. Although it is one of the easiest grapes to grow, it only sets fruit outdoors after a long, hot summer, whereas in a greenhouse it sets freely, producing large bunches of dark red or purple grapes year after year.An unheated greenhouse is better than a heated one, as natural ventilation is always better for your vine. Regarding the container, if you want it to grow freely and have lots of grapes then outside planting would be better as grape roots can travel downwards by around 30ft, making for more fruit in September. Grapes grown in the UK are always smaller and fuller flavoured due to our cooler climate, and if you are comparing them in size with the table grapes we see in the supermarkets - they have a very high water content. Happy growing.